Exciting news this week! 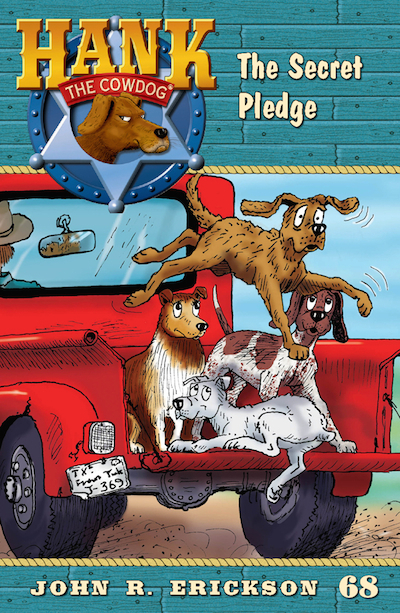 We're pleased to announce that Hank the Cowdog #68: "The Secret Pledge" is at the printers and set to be released on OCTOBER 5th! Of all the mysteries Hank has faced in his illustrious career as the Head of Ranch Security, the only one that still has him truly stumped is the key to unlocking Miss Beulah’s heart. Why on earth would she go for a bird-brained bird dog when a specimen like Hank stands ready to sweep her off her feet? Could there be more to this problem than meets the eye? When Plato wanders off Billy’s ranch and Beulah discovers he’s lost, she tries to enlist Hank’s help to rescue him, and this presents Hank with a real moral dilemma: Will he help find his rival, or will he leave Plato to face the dangers of coyote country by nightfall alone? Be sure to check back soon here on Hank's Blog for more details and contests in the coming weeks!